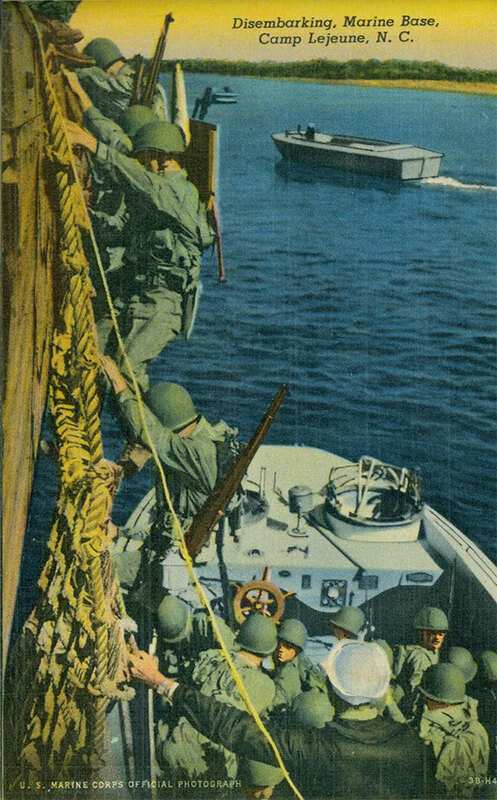 Prior to World War II the missions of the Marine Corps had included the second task mentioned above[MG1] , the detachment of security units to the ships and shore stations of the U.S. Navy, plus expeditionary duty in support of the State Department and cooperating with the Army in protracted land campaigns. As part of the first task, Marines were to defend the Navy’s far-flung advance bases in conjunction with the Navy’s plans for defending U.S. territorial possessions and other “interests” in the Pacific and Atlantic-Caribbean regions. The development of amphibious assault doctrine also began to emerge during the early years of the twentieth century. Amphibious assault would involve sending in Marines to seize a designated area in order to establish advanced bases for subsequent naval and land campaigns. This approach was thought to be especially important in the Pacific region, where Japan had emerged as a substantial naval power and potential threat—a contingency for which the Navy began to prepare by drafting an elaborate plan of war, known as War Plan ORANGE. By 1920 the Navy had determined that all of its future development would proceed in accordance with War Plan ORANGE, and it strongly recommended that the Marine Corps be prepared to launch—at short notice—an expeditionary force from the West Coast for a naval campaign in the Pacific. Although the Pacific was generally regarded as the Marines’ first priority, the Navy also recommended that the Marine Corps establish a similar force on the East Coast for Atlantic and Caribbean contingencies. 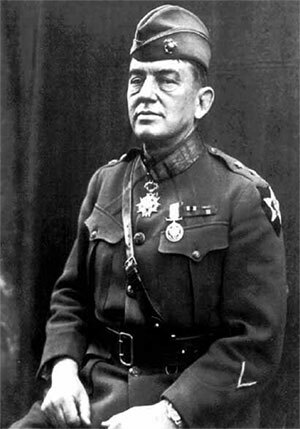 Lieutenant General John A. Lejeune (1867-1942), a graduate of the U.S. Naval Academy and Commandant of the Marine Corps from 1920 to 1929, was an early proponent of the amphibious assault plan. General Lejeune reorganized the Corps to reflect its new wartime mission, and ordered substantial improvements in training for the seizure by amphibious assault and defense of advanced naval bases, in addition to general education for officers and troops. Disembarking Marine Base, Camp Lejeune, N.C.
Once the idea of seizing and defending advance bases had been more or less accepted among the Marine Corps leadership, debate centered on the issue of how exactly to carry out an amphibious assault. 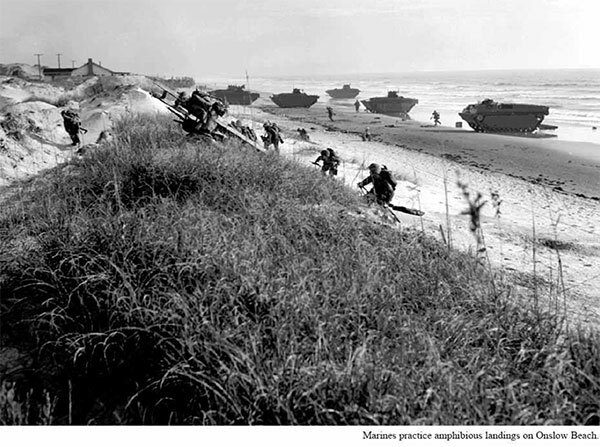 At that time a successful amphibious landing on a hostile shore was considered to be almost impossible. World War I had provided few successful examples of such operations, so the Marine Corps resorted to trial and error in a series of maneuvers and operational exercises—the latter in conjunction with the Navy and occasionally the Army—between 1921 and 1941. As a result of the exercises and continued refinement, by the early 1930s Marine Corps doctrine was committed to the new primary mission of amphibious operations in support of the fleet, which General Lejeune considered to be the raison d’être of the Corps, but there had been very few opportunities for the Corps to put their mission into actual practice. The creation of the Fleet Marine Force (FMF) in 1933 marked a turning point in amphibious development, because with it the Marine Corps acquired the tactical structure necessary to carry out its primary wartime mission: to serve the fleet by seizing advance bases for naval operations, and, once captured, to occupy and defend these bases.